NORTH ROBINSON — Three Colonel. 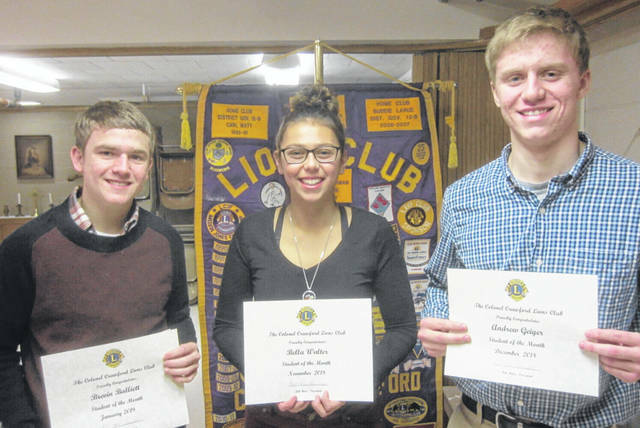 Crawford High School seniors were awarded the Lions Club Student of the Month award over the last few months. The students and family members were all guests of the C.C. Lions Club at their January dinner meeting. Each award winner was presented with a commemorative certificate and a check for fifty dollars. Bella Walter is the C.C. Lions Club Student of the Month for November 2018. She is the daughter of Phil and Anna Walter. Bella has earned Academic letters each year and serves as secretary of the National Honor Society. Miss Walter is a member of Student Council, Project BLACK., and Young Life. She has earned the Project BLACK. Integrity Award. Bella participates in all the high school bands at Colonel Crawford, which include marching, pep, concert and rock bands. She is also a member of the Mansfield Symphony Youth Orchestra. As a member of Dairy Maids and Gents 40-H Club, Bella has been a camp counselor and serves on the Junior Fair Board. She is also a competitive dancer for Eagle Dance Center. Through her various organization memberships, Miss Walter has participated in many community service projects. Bella attends Galion St. Joseph Catholic Church. She plans to attend college, but her major is undecided. The Student of the Month for December 2018 is Andrew Geiger. He is the son of Robert and Tonya Geiger. He is a National Honor Society member and has attended Buckeye Boys State. Andrew is a three-year varsity football letter-man and, also, a member of the Colonel Crawford Leo Club. He serves as vice-president of the Liberty Leaders 4-H Club and earned Senior Showmanship Champion for dairy feeder calves in 2016. Andrew’s community service projects include helping with the Liberty Township Firemen’s Festival and helping with tornado damage clean-up in North Robinson. As a member of St. Paul Lutheran Church in Sulphur Springs, Andrew participates in Youth Group. He is employed at Family Farm & Home in Bucyrus. He plans to attend The Ohio State University and possibly pursue a degree in occupational therapy or another area in the medical field. Brevin Balliett was selected as the January Student of the Month. He is the son of Rick and Carolee Balliett. He is a member of National Honor Society and serves as vice-president. He has earned three Academic Letters. Brevin was a four-year member of the football team. He has also participated in a CCHS musical and been part of other musical activities including Vision show choir, Solo Ensemble and Concert band. Brevin also won the Rotary Club Speech Contest. Mr. Balliett attends Galion Alliance Church where he participates in the Peanut butter & Jelly program. Brevin plans to attend college and will major in education.